Stuart Lee Murdoch (born 25 August 1968) is a Scottish musician, writer and filmmaker, and the lead singer and songwriter for the indie pop band Belle and Sebastian. Murdoch's parents made him take piano lessons during his childhood, and even though he claims not to have enjoyed them at the time, he says he now "appreciates this decision vastly". Apart from early musical activities at secondary school (at the age of twelve he formed a band with fellow pupils, in which he played the piano), Murdoch first became publicly involved in music as a radio DJ for Subcity Radio at the University of Glasgow. Whilst at university at the end of the 1980s, he became ill with myalgic encephalomyelitis, or Chronic Fatigue Syndrome, and was unable to work for seven years. Murdoch said that the isolation of these years is what led to his becoming a songwriter: "That was a big desert at the time, a kind of vacuum in my life. From that, these songs started coming out, these melodies where I could express what I was feeling." By early 1995, Murdoch had largely recovered from his illness and began to look for fellow musicians to form a band, which became Belle & Sebastian. Murdoch's struggle with Chronic Fatigue Syndrome is the subject of the song 'Nobody's Empire' on the Belle & Sebastian album Girls in Peacetime Want to Dance. This was also when he began living above a church hall and working as its caretaker, a position he maintained until 2003. In 2004 he told The Guardian, "I'm not actually a Christian with a capital C. I'm still asking questions. But I had this time when I found myself singing all these old hymns in my kitchen and I couldn't work out why I was doing it. Then one Sunday morning I got up, looked at my watch, and thought, 'I wonder if I could make it to a church service?' It was so welcoming. It just felt like you were coming home. Twelve years later, I've never left". 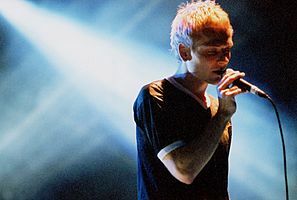 Murdoch's interest in faith has been perceptible in his lyrics over the term of the band. Belle and Sebastian's first album included lines about "reading the Gospel to yourself," and on the second Murdoch sang of "the pain of being a hopeless unbeliever." Religious references became more confident and direct on later albums, including "If You Find Yourself Caught in Love" (which continues "say a prayer to the man above" – this line becomes a refrain) on the album Dear Catastrophe Waitress; and the two-part "Act of the Apostle" on The Life Pursuit. Regarding "If You Find Yourself Caught in Love," Murdoch told Gross, "At the time I was writing it I thought, well, should I be so overt? Because I've often couched any religious overtones within characters in the past, but this is a bit more out there. And then I just thought, come on, you've been doing this for years, why not? Why not just be a bit more straightforward?" Sexually ambiguous lyrics in Belle & Sebastian's music have prompted Murdoch to confirm his heterosexuality in the press, calling himself "straight to the point of boring myself". Murdoch ran the Glasgow Marathon in 1986, and finished with a time of three hours. Murdoch is a vegetarian. He married long-time girlfriend Marisa Privitera on 26 November 2007 in New York City. Privitera is on the cover of Belle and Sebastian's DVD Fans Only, and LP The Life Pursuit. Their eldest son, Denny, was born in May 2013. Second son Nico was born in November 2016. Murdoch was diagnosed with colour blindness at an early age and does not drink. "I like a Scotch whisky but I'm allergic to alcohol, would you believe, which is a tragedy in itself," Murdoch says. "It's only in the last couple of years. I got eczema and one of the things I had to do to get rid of it was give up alcohol." In 2009, Murdoch contributed the song "Another Saturday" to the AIDS benefit album Dark Was the Night, produced by the Red Hot Organization. Murdoch was one of the most notable protesters attending a 5 December 2009 march in Glasgow, supporting governmental intervention to combat climate change, prior to the United Nations Climate Change Conference 2009 in Copenhagen. In 2010, Murdoch published his first memoir, The Celestial Café. Over 2012–2013, Murdoch wrote and directed the musical feature film God Help the Girl, being released internationally and online in 2014. ^ "Stuart Murdoch". belleandsebastian.com. Retrieved 2018-04-10. ^ Parkhouse, Will. "Didn't See It Coming: An Interview With Belle And Sebastian". The Quietus. ^ "Raising their game". The Guardian. 17 July 2004. Retrieved 11 April 2011. ^ "Pop stars running marathons: Belle and Sebastian". Run and Jump. 12 September 2014. Retrieved 8 November 2017. ^ The 2008 World's Sexiest Vegetarians Are…, peta2.com; accessed 15 June 2015. ^ "Denny Alexander Murdoch". Herald Scotland. 31 May 2013. Retrieved 27 April 2016. ^ stuart murdoch [@nee_massey] (5 November 2016). ""Reasons to be Cheerful, Part 2" - Nico Robert Salvatore Murdoch. Born Nov 4th at 0345. Mum and child all well. X" (Tweet) – via Twitter. ^ "Scotland 'a pioneer for good' on climate". BBC News. 5 December 2009. Retrieved 24 May 2010. This page was last edited on 6 February 2019, at 19:01 (UTC).